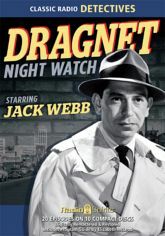 Jack Webb was never an actual law enforcement officer, but listeners could be forgiven for thinking that he was - such was the gritty honesty that formed the backbone of his iconic character, Sgt. Joe Friday. Friday and his partner Ben Romero (played by Barton Yarborough) were two hardworking cops just doing their jobs. And those jobs carry them from one gripping real-life case to the next in this collection of twenty digitally remastered episodes from the early years of Dragnet, radio's finest police drama!